Import those files in HexScape (Option button => Asset tab) and you're set ! The team is already working on the others figure. Their goal is to make all officials figure, in the order of original release, then go for VC figures ! And then, who know ? C3G, HoSS, Pokemon, you name it ! HexScape allow you to load map from .hsc files. You can either download VirtualScape and create your own map, or just use one of the numerous map in the .hsc already avalaible on the internet. If you search some tournament quality maps, search no further than Tyhpon2222 selection of 46 top notch maps ! Spuke Boy kindly updated its HAC (Heroscape Army Creator) site to support export to HexScape format ! Use it to create your army and get the needed .hsa file. Remember however that for now, only figures from the MS1 and Waves 1, 2 and 3 are avalaible. 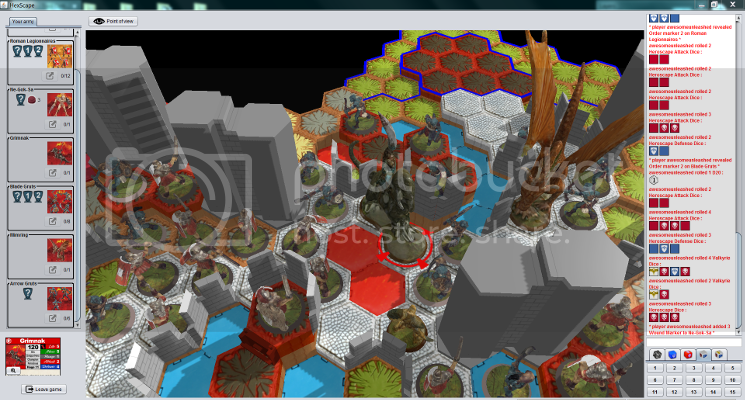 Please enjoy your online Heroscape ! Don't forget to post here your awesome screenshots ! Last edited by Lyrgard; March 10th, 2016 at 03:11 PM. I was wondering if there was an update on the availability of more assets, is there any news on when more figures will be released? Amazing work, hope you keep at it! As I said you by pm, we have nearly finished the wave 2. We're facing a problem through : we are not able to get 3D model of adequate quality reliably. For some figures, we only achieve poor models and are stuck. Also, the motivation is not at his highest for taking photo, so the process is somewhat halted for now. But you asking this question motivated me to try new things. I'll see if I can manage better results ! The best would be t have access to a 3D scanner, right ! "An error occurred while trying to unzip C:\Users\admin\Downloads\MainAssets.hsd"
The asset file doesn't appear to be a zipped file. Anyone have a solution? What the import does is unziping this file into the asset folder where you installed HexScape. You probably installed HexScape in a protected directory that need admin privilege to write to. (like C:\Programmes). You were able to do it because the installation run with admin privilege. - Rename the .hsd into .zip and manually unzip it in the asset directory in your installation folder. I moved the files and got much closer. I think this is probably the issue. Still had a problem with the program loading some of the terrain. I'm going to start over with a fresh set of downloads. I had old and new versions of some of the files in the same folders - it was a bit of a mess. Thanks all for this wonderfull result ! Oh, and I'll let you know, the team is in a frenzy !! The Wave2 is not yet out that Wave 3 is nearly ready, Wave 4 in a good way, and they started doing Wave 5 ! It is a really tedious work, very time consuming. They really deserve praises for doing that !